Everything But The Girl took a sharply different turn when Missing became a hit, around 1994 or so, if I recall. A remix played up an electronic sound, which made the tune a worldwide smash - quite the change for a duo that had been used to being beloved at a bigger-than-cult, smaller-than-mainstream level for years. unearthing old demos & pics of me and @tracey_thorn. deluxe 2xCD reissues of first four EBTG albums will happen this year. Tracey Thorn, performing last year on Later ... With Jools Holland. One of my favourite voices. Tracey Thorn recorded this song in 1982, although I didn't hear until years and years later. It's a gem. 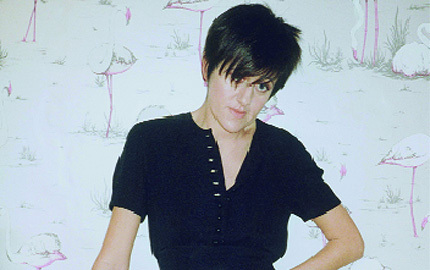 Tracey Thorn has meant something to me for more than a generation, as I would imagine she does to a whole generation who fell in love with the voice and later were OK with tapping their toes to what Thorn calls her "bedsit disco torch songs." I was curious to learn that Thorn has recorded a new solo record - her first in 26 years - and have been really, really pleased with the samples available on Thorn's MySpace page. Welcome back. Nicos Chelsea Girls, the Au Pairs live, Pete Shelley, Scritti Politti, Im still waiting by Diana Ross, Young Marble Giants, Patti Smith, Postcard records, Sandy Denny, Pet Shop Boys, Ceremony by New Order, Sufjan Stevens, Bless the Weather and Solid Air, Joanna Newsom, Evelyn Champagne King, Gypsies Tramps and Thieves by Cher, The Specials, Blossom Dearie, Aretha Franklin, The Smiths 1983-85, Jonathan Richman, Massive Attacks demos on cassette 1993, Judy Garland, Dusty Springfield, Mike Skinner, Low, Rufus Wainwright, Astrud Gilberto, Shannons Let the Music Play, Bjork and Polly Harvey at the Brits, Cocteau Twins, Arthur Russell, Roisin Murphy, Beth Gibbons, Phoenix, Vic Godards Whats the matter boy, and singing with Fairport Convention at Cropredy and Jeff Buckley at Glastonbury..
Where else could you read of Cher, the Specials, Blossom Dearie, Aretha Franklin and the Smiths in a row ... and it all make perfect sense?